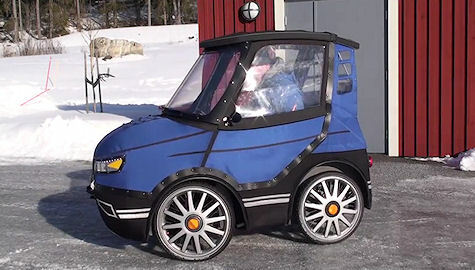 Swedish designer Mikael Kjellman has created a unique vehicle that looks like a tiny car, but has the internal workings of an electric bicycle. He calls it the PodRide bicycle car. The bicycle car has several advantages over a traditional electric bicycle - it comes with a waterproof body, heated windscreen, soft seat with back support, studded tires for snowy roads, and air suspension. You're right. Should have been called a quadracycle.